Join the Redux Design Hangar NOW. Surveys inside! | Redux & Co.
#COURGcrew — Welcome to the Redux & Co. Workshop Hangar! I wanted to get this out yesterday, but I have to be honest with you all for a moment here (as usual I’m sure you’ve noticed). I’ve been so bummed and whelmed by all the chatter and squeaky wheels that it stalled me a bit and I lost sight for a couple days of the FACT that there are hundreds, dare I say over a thousand backers who aren’t complaining or demanding, and are simply enjoying the ride. There are so many of you who have gone far above the call of duty to make this project truly what I intended and all that I had hoped for. From simple thank you notes, kind thoughtful personal messages, and pep talks to elaborate design proposals, sketches, and not a small amount of prayer. I’m thankful to say that I think we’ve worked together not just to buy watches, but build a community around a mission instrument we’ve crafted together. Lots of watch brands and KS watch project creators probably covet a spot in GQ or some such. Not us. One of our proudest moments came with a request for an interview from PRINT Magazine, an iconic brand dedicated to design. Zachary Petit, the editor, offered up this headline: How a Non-Designer Designed an Amazing Watch. Petit asked me some really thoughtful questions which allowed me to expand a bit on the COURG design ideas which were left on the cutting floor as I prepared the campaign page. Check it out! As you’ll see in the designs, we’ve had lots of brainstorming in the crazy comments section, as well as over email, Twitter, FB, and in person. I’ve been floored by the outpouring of passion for COURG and here is our itinerary for design iteration to finalize our flight plans. Drilled lugs. I had proposed the screw pin and to be honest I’m sad that we won’t go with screw pin this flight. I like both the functional strength it adds, and also the aesthetic reinforcement of a tool for every mission. However, I heard a lot from people with decades of watch experience that added up to horror stories about stripped pins, locked-up pins, and irreplaceable parts. I feel like hex pins might prevent the stripped pins, but that’s only conjecture at this point. I would feel more comfortable if I had personal experience and particularly had screw pins on the prototype. I can’t in good confidence ship close to 2,000 watches without having field tested that personally. 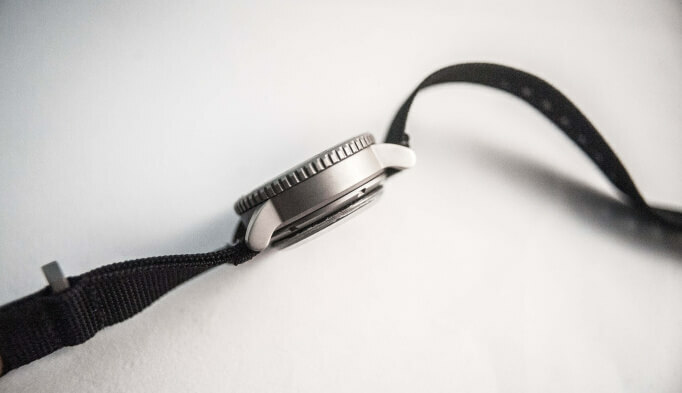 Drilled lugs provide the strength we need, with the guarantee that parts will easily be found wherever your adventure takes you, and will not fail you when you decide you want to use a two-piece strap or some such. I priced the levels of multiple variants for individuals who wanted to own different variants, not as a way for people to make group buys. However, I understand that some of you got together to grab yourself an extra deal. Though it’s not what I intended, I can dig that you guys banded as friends and can share COURG and courage together for wherever your missions lead your crew. I’m all for it. Multiple watch variant backers: Order any combination of variants you like. You’ll noticed I’ve applied the brakes on our funding as I want to manage our production levels to a level I think is reasonable. We could have gone for “most funded Kickstarter mechanical watch” — but you know what? We don’t care, that’s not the point. Based on our quantities I’ve double checked with the manufacturer and Ti5 is a possibility if we don’t hit the goal, IF we are able to hit a minimum order quantity of 300. So, if you’re serious about that and will add-on the $20 and accept 10-15 day delay, weigh in on the universal all-hands survey below. Below, you’ll see 6 design refinement surveys. All backers check in with the first survey as that pertains to universal design elements. For the other 5 design variant surveys: PLEASE ONLY TAKE THE SURVEY FOR THE VARIANT YOU ARE BACKING! I will give this phase of surveys 3 days based on our experience from the preliminary survey for critical mass of responses. After that, we’ll debrief with a final drawing of each dial and hand combination and case construction. And did I mention? DON’T SHARE THESE ON SOCIAL MEDIA! Thanks for the nimble flight patterns so that we can get into the fun stuff now!